MozBackup is a simple utility for creating backups of Mozilla Firefox, Mozilla Thunderbird, Mozilla Sunbird, Flock, SeaMonkey, Mozilla Suite, Spicebird, Songbird and Netscape profiles. MozBackup allows you to backup and restore bookmarks, mail, contacts, history, extensions, cache etc. MozBackup is an easy way to do Firefox backup, Thunderbird backup ... MozBackup is developed in Czech republic. 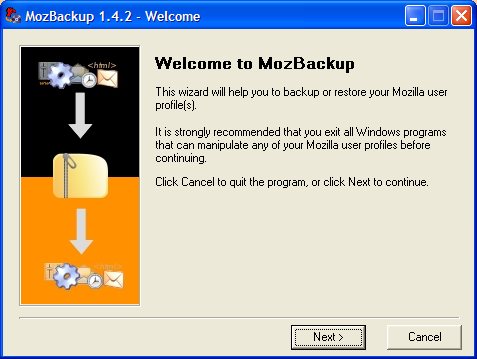 MozBackup software is freeware (even for commercial use) and works on Windows 98/ME/NT/2000/XP/2003/Vista/7. MozBackup is developed in Czech republic. Qweas is providing links to MozBackup 1.5.1 as a courtesy, and makes no representations regarding MozBackup or any other applications or any information related thereto. Any questions, complaints or claims regarding this application MozBackup 1.5.1 must be directed to the appropriate software vendor. You may click the publisher link of MozBackup on the top of this page to get more details about the vendor.